Even though medicine has developed tremendously, cancer is still today a chronic and life threatening disease. Recently, patients are turning to traditional therapies such as acupuncture for cancer management as opposed to the aggressive approach of modern medicine. There has been much research published indicating that acupuncture is beneficial for chemotherapy-induced nausea, vomiting, and cancer pain.Other data also suggests acupuncture might be effective for chemotherapy-induced leukopenia, postchemotherapy fatigue, radiation therapy-induced xerostomia, insomnia, and anxiety. In this article we introduce six case studies on the disappearance of carcinoma/cancerous syndrome after acupuncture treatment and the use of herbal medicines. The goal of this paper is to show that acupuncture has direct anticancer effects and should be used in the first instance before turning to more aggressive therapies. 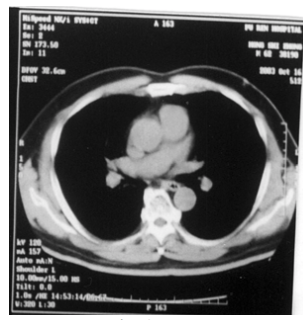 On May 2002, the patient was diagnosed with Lung CA. The CT scan showed the mass was 3.6 x 3.7cm and 5 days was increased to 5.3cm x 4.00cm and had compressed the right middle lobe bronchus and the right pulmonary vessels, the mediastinal lymph nodes had metastases. The patient repeated the scan in Singapore, which showed that the mass had increased almost 40% compared with the first CT scan in a very short period of time. Furthermore, the patient went to another hospital in Tianjing, Beijing for a further opinion. On 17 June-12 July 2002, he underwent 20 sittings of radiation therapy, after that, the CT scan showed that the mass had continued to reduce in size. The mass almost disappeared after 3 months. A group of consultants from the oncology department of the 4th Hospital of Beijing advised the patient to continue chemotherapy, but his chief Chinese physician from another hospital gave him Chinese medicine instead. Within 3 years, yearly CT scan showed the lungs were cleared. The Chinese herbal medicine which the patient took was Qi Bei Fei An Wan Fang, Chansuzhueye, Yadanzi, Chinese Ganoderma Lucidum Essence etc. Suggested acupoints were E-system Lung and Throat at metacarpal bone, Zusanli (St 36), Dazhui (Du14), Feishu (Ub 13) and Auricular Lung & Throat point. Direct moxibustion on Zusanli (St 36) was performed twice a week. In addition, food remedy such as white butter, Jew’s ear, Kiwi and Asparagus also aided in recovery. This patient is an interior designer. The patient presented with a Fibrosarcoma of 7cmx3cm in his left medial thigh, near acupoint Xuehai. Due to the pain, he had difficulty in walking. In the past 12 years, he had undergone 3 operations to remove the recurring cyst. In May 2003, he was distressed that the cyst recurred but he was reluctant to be hospitalized. In our treatment program we performed micro-cut therapy to remove the discharge. The acupoints prescribed were local points, using a box system theory, supplemented with acupoints Yinlinquan (Sp9) and Sanyinjiao (Sp6).